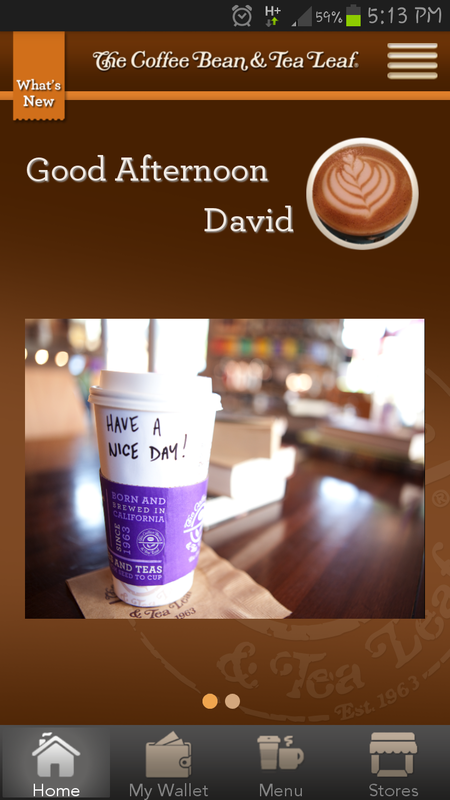 I know this is not really beauty related, but for my love for Coffee Bean's English Breakfast tea latte .. I gotta share this piece of information. 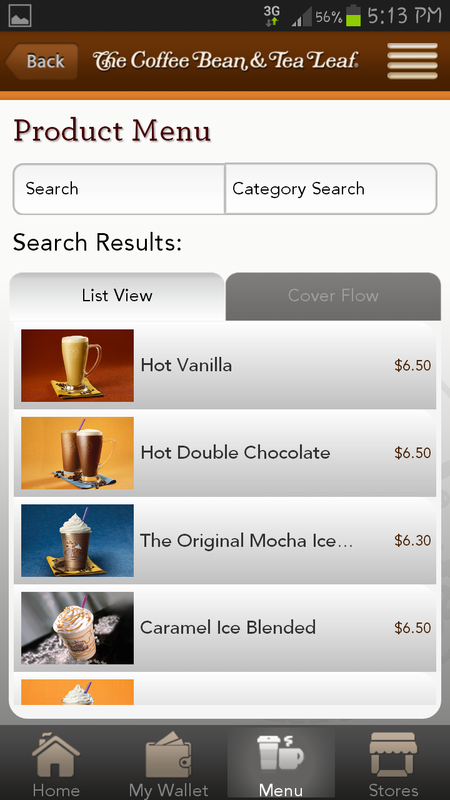 The Coffee Bean & Tea Leaf® officially launched The Coffee Bean Mobile App - the first mobile app in Singapore’s food and beverage industry that integrates mobile wallet, e-loyalty redemption and e-voucher capabilities to deliver new levels of customer experience and increase operational efficiency. 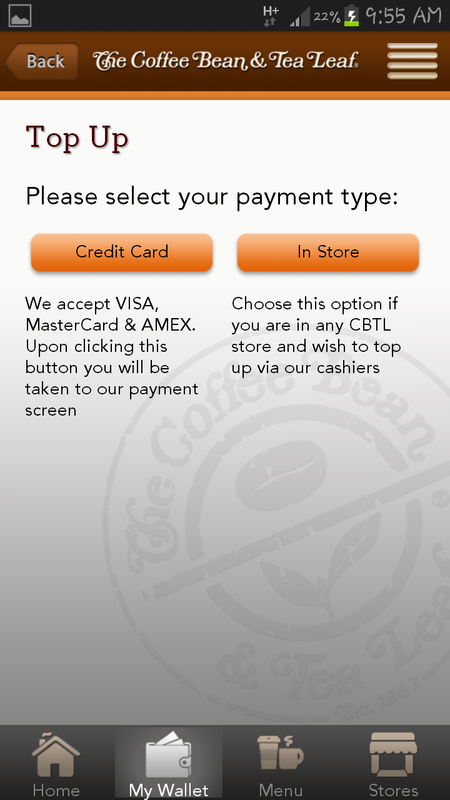 By downloading The Coffee Bean Mobile App to their smart phones and loading it with value anytime, anywhere with a credit card or at selected The Coffee Bean & Tea Leaf® outlets *, customers can enjoy quick, cashless purchasing experience at the touch of a button on their smart phones at digital scanners at the store counters. They can reload their mobile wallet with their credit card through the app itself or at the outlets when the value runs low. 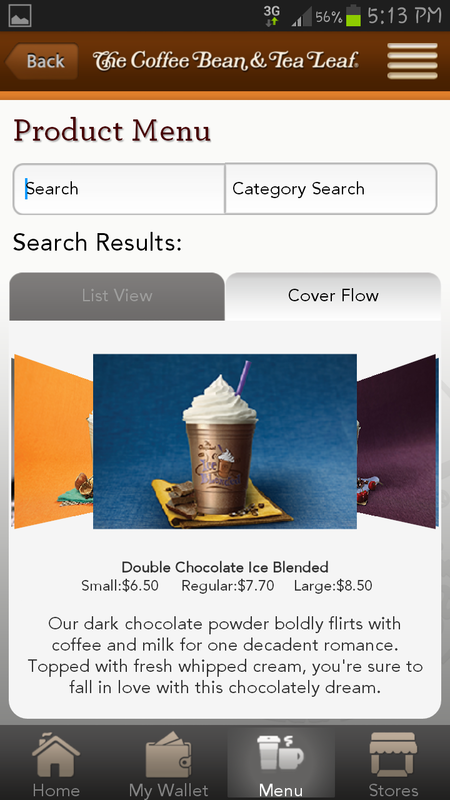 Other useful features of the app include transaction history, evouchers, news feeds of the latest special events and promotions, drinks listing, personalized greeting, store locator and operating hours. 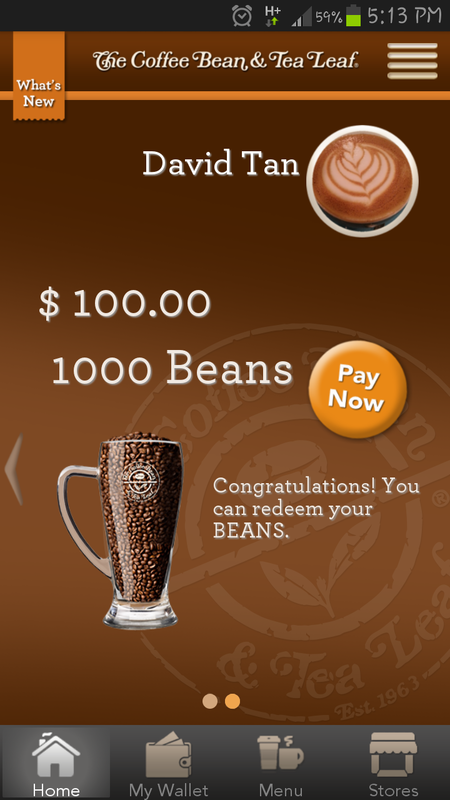 In addition, The Coffee Bean Mobile App also doubles up as a loyalty app that rewards regular customers with loyalty points called “BEANS” which can be subsequently redeemed against purchases at the outlets. 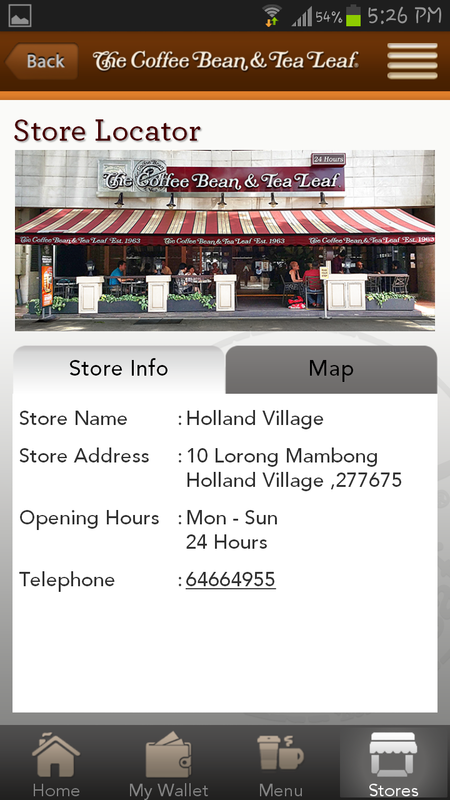 The Coffee Bean Mobile App can be downloaded from the App Store and Google Play Store. 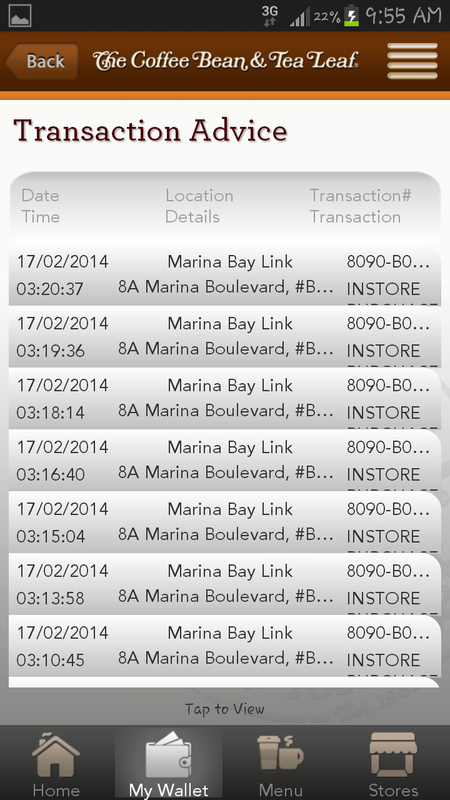 By completing a one-time simple registration, customers will enjoy a complimentary $5 e-voucher. Other rewards include a complimentary slice of cake during their birthday month and double bean points when they purchase on their birthday. 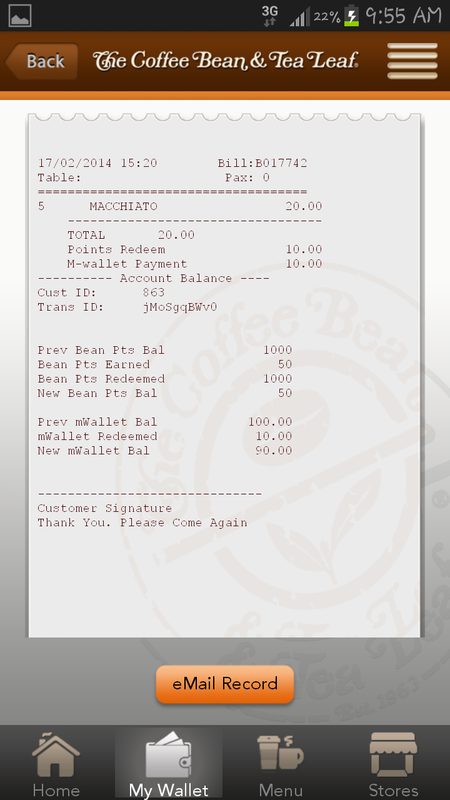 “At The Coffee Bean & Tea Leaf®, our philosophy is to deliver the finest quality to our customers, whether it is products or services. 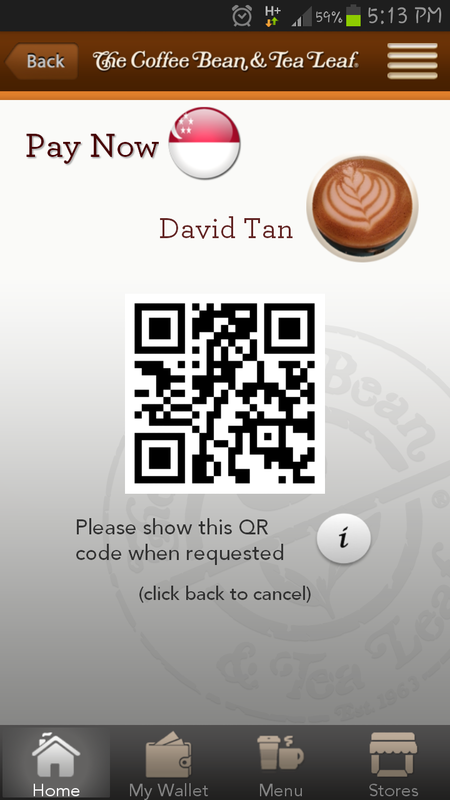 To evolve with an increasingly digital mobile lifestyle, we are presenting our customers with The Coffee Bean Mobile App, so that they can savor a delightful concoction of contactless payment, e-redemption and many other value-adding benefits,” said Mr. Alvin Goo, General Manager of The Coffee Bean & Tea Leaf® Pte Ltd.
“The launch of this app is the beginning of a new digital era for The Coffee Bean & Tea Leaf® Singapore. We are committed to continue to innovate and add more features to this app to enrich and enhance our customers’ lifestyles,” added Mr. Goo. Cool... I'm downloading this app while blogging about it!